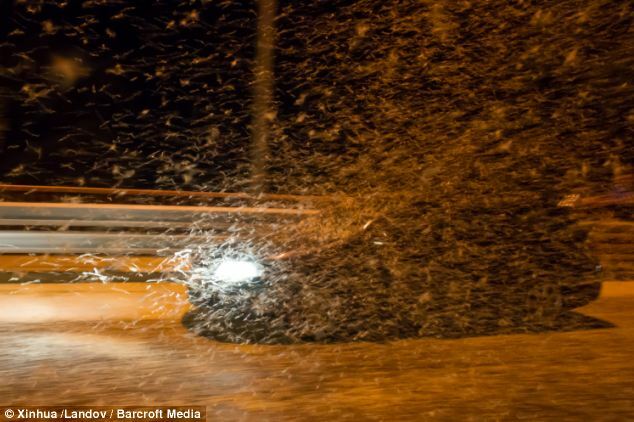 Mayflies Return to the Danube River in large swarms. Light pollution is a problem for some firefly species. It can also be a problem for mayflies. A group of scientists* studied the large numbers of Ephoron virgo mayfies that were swarming on a bridge over the Danube River in Hungary. They found that millions of mayflies were attracted to the bright lights on the bridge. Thousands of female mayflies deposited their eggs on the bridge below and many were crushed by automobiles. What attracts the mayflies to the bridge? Bright lights themselves are attractive to these mayflies and some of the swarm was noted on the lights. Why do they lay their eggs on the bridge? Mayflies detect water because it reflects unpolarized light in a polarized direction. The scientists determined that the bridge surface also reflected light in a polarized manner that mimics the appearance of water as determined by the mayflies. Because the bridge is closer to the lights than the water below, the intensity of polarized light is greater on the bridge surface than on the water below. The light pollution misleads mayflies into laying eggs on the bridge where they perish rather than in the water where life is good. *Szaz D, Horvath G, Barta A, Robertson BA, Farkas A, et al. 2015. Lamp-Lit Bridges as Dual Light-Traps for the Night-Swarming Mayfly, Ephoron virgo: Interaction of Polarized and Unpolarized Light Pollution. PLoS ONE 10(3): e0121194.